Bunting! 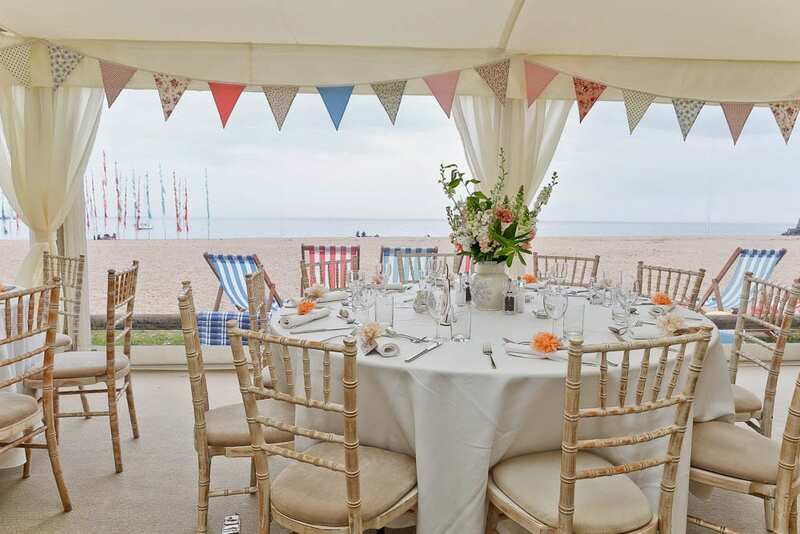 Ideas and Tips for your Wedding Marquee. 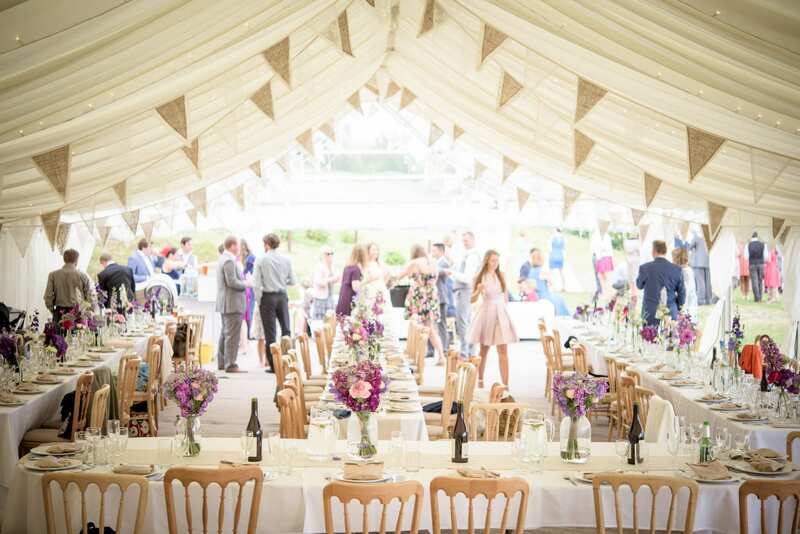 When it comes to decorating your wedding marquee you don’t need to worry about whether certain colours work better than others – they all work brilliantly! 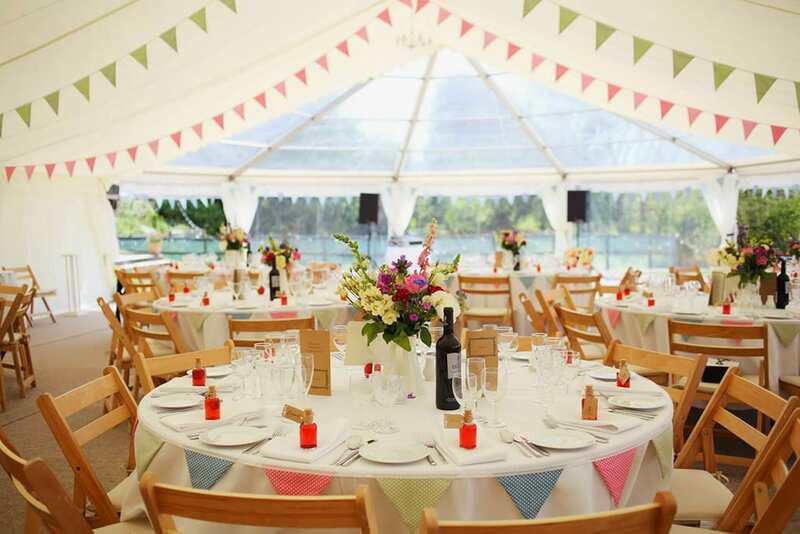 Bunting is great for bringing some colour to the lofty roof space and whether you choose bold, soft or neutral tones, all will add interest and style to your marquee. 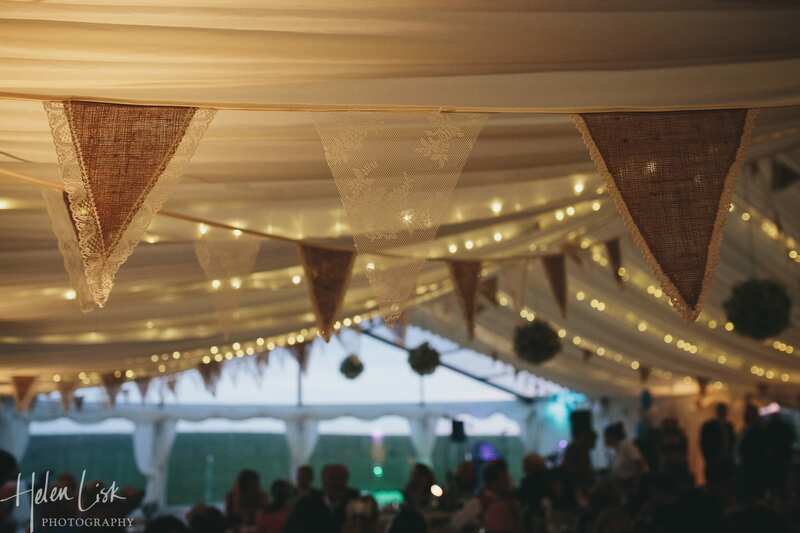 Bunting can be hung from the ridge of the marquee to the top of the side walls (it’s up to you as to how many lines of bunting you wish to use) and it can also be hung along the top of the walls. 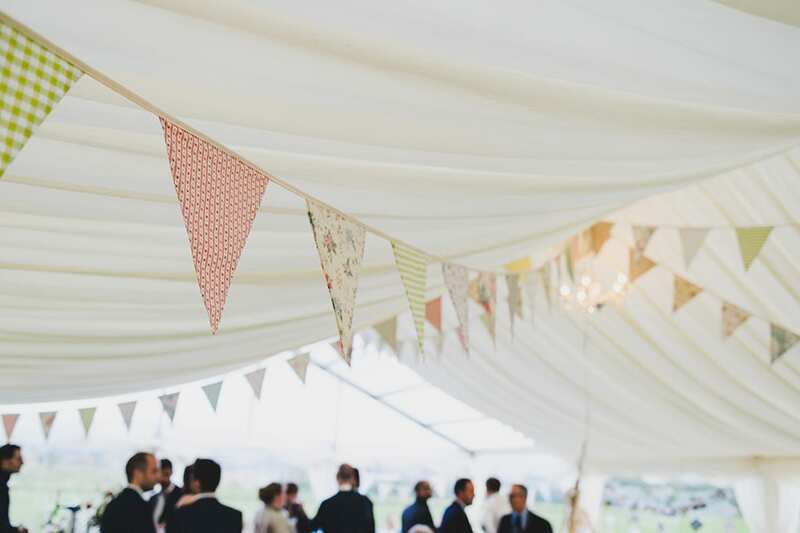 Outside bunting can be strung to create a walkway to the marquee or used to create an outside area. Combine with fairy lights both inside and out and you can create a beautiful effect both day and night. Don’t be shy – bunting is one of those decorations where you can’t really have too much, but if you have too little the overall affect can be lost. Bunting can also be used to decorate the rims of dining tables and chairs, bars and by adding letters, it can be used to add a message! 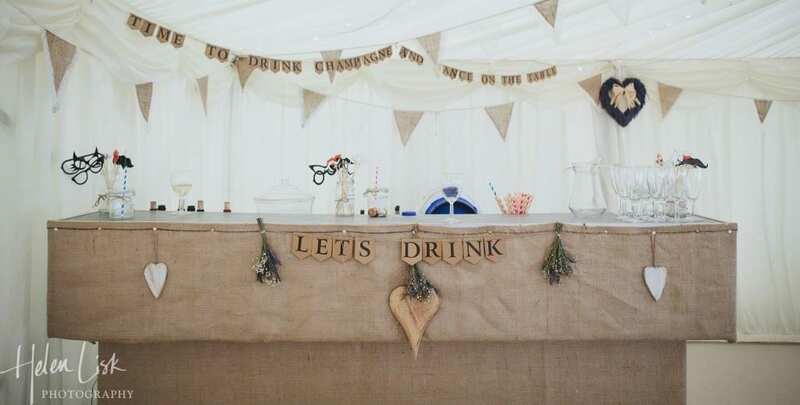 So be creative and think about how you might use bunting in your own marquee. You will need to do a bit of calculating to work out how much bunting you’ll need based on the size of your marquee. 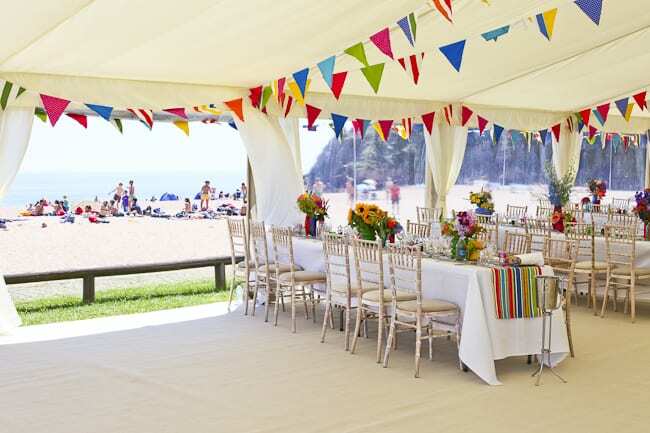 Remember to ensure you have a good length at either end for tying to the marquee metal work and an allowance to enable the bunting to hang, rather than being stretched taut. The key measurement that you will need is from the top of the wall to the ridge of the marquee. For one of our 9m width marquees allow 6 m from the top of the wall to the ridge (this measurement has an allowance for the bunting to hang). If going diagonally across a 3m bay from the top of the wall to the ridge allow 6.5m. For one of our 12m width marquees allow 7.5 m from the top of the wall to the ridge (this measurement has an allowance for the bunting to hang). If going diagonally across a 3m bay from the top of the wall to the ridge allow 8m. Where to get bunting from? Bunting can be made quite easily, although perhaps calculate how much you need before making that decision or handing the job over to someone else! DIY bunting gives you complete control of the colours, style and texture of the materials but if you can’t face the task then there are companies that will make it or hire it to you (granny janny’s bunting, funky flags bunting). 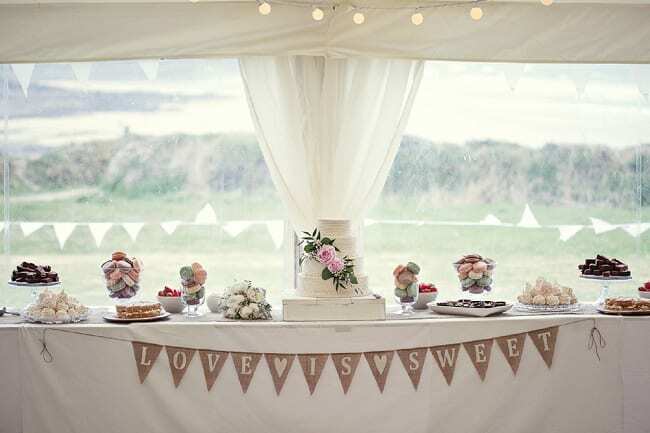 For more ideas and on different styles of bunting, take a look at Bridal Musings blog: 10 new and unique ways to use bunting at your wedding.